Thinking about the Brandenburg-Prussian music one immediately recalls names like Friedrich II, J. J. Quantz and C. P. E. Bach. They all represent the music of the 18th century. Before that Berlin- Brandenburg apparently had nothing to offer of musical importance – a complete false conclusion. The Brandenburg court band of the early 17th century could compete with every court band of its time regarding size and importance. Celebrities such as William Brade or Nicolaus Zangius were highly popular amongst the european nobility – both of them were conductors at the Kurbrandenburg court. In the middle of the 17th century, under the ruling of the so called great elector, the court became a Mekka of the viol players. The viol elite met up and stayed there for many years. Whole generations of viol players were educated at the Berlin court. Even the Eleven from abroad they came to study under Walter Rowe and Dietrich Stoeffken. 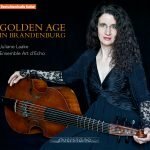 Suitably ambitious, versatile and diversified is the programme “Golden Age in Brandenburg” – there is everything – from many-voiced viol consort with harp accompaniment to solo suite, from complete strangers (CD – world premiere recording) to Evergreen, from contrapuntual-experimental to dance music.